Troop 10 meets Sunday Evenings at 6:00 PM at Shiloh United Methodist Church, 4149 Odell School Road Concord, NC. 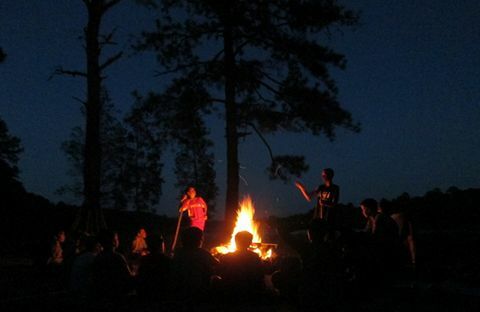 Our Troop averages one campout or outing every month and we plan our calendar a year in advance to make it happen. In between outings we work on team building challenges, advancement skills, planning the next campout, and have fun. Our scouts advance by doing what scouts do. Our focus is on exposing scouts to experiences that help them to develop, reinforce, and master skills that will last a lifetime. We firmly believe in the boy-run boy-lead patrol method. Our scouts elect their own leaders, make their own decisions, learn from their mistakes, and teach each other. Troop 10 currently has about a 3-to-1 boy to Scoutmaster ratio. So even though we are a boy-run troop, we have plenty of supervision for our frequent camping trips. We also have a very active committee and a supportive sponsoring organization. For more information, click on the About Us link in the right hand menu. To get in touch with us, click on the Contact Us link in the right hand menu. We hope that you like what you see and come for a visit. We are always looking for more boys to share our scouting adventure! Reminder, there will be no meeting on Easter Sunday. We had to move a few things around on the calendar in the next few weeks and I wanted to make sure nobody is surprised. All of this is also on the troop calendar if you have that synced to your personal calendar. New Work Date for the Eagle Project is March 30th. See calendar for more details. Headed to the Adirondacks at Camp Raven Knob, and working on reinforcing on some Patrol skills. Pack warm, it's going to be a cold one! Scouts, check with your patrol leader for dates, times and other info. Troop 10's Gaius Carter is in the February 2018 issue of Boy's life! Gaius' skill with a bow is recognized nationally and internationally and landed him the spot in the HeadLiner's section on the lower half of page 12. Check it out! This is also the first time Troop 10 has ever been mentioned in a national publication. Thank you Gaius for making it for something positive! As announced in last week’s troop meeting, we have unique opportunity to be part of a great event!